Many people choose to follow a reduced calorie, low-fat diet to lose weight. While caloric requirements are highly individual and depend on a number of metabolic and lifestyle factors, choosing a 1700-calorie per day diet will produce slow but steady weight loss for many people. The sample menus below contain about 450 calories per meal and less than 25 percent of their total calories from fat. Choose one meal each from breakfast, lunch, and dinner as well as two 150-200 calorie low-fat snacks. Choose one of the following breakfasts. Add cinnamon, raisins, and pecans. Add Stevia if sweetness is desired. Choose any of the following lunches. Mix with chicken and chopped vegetables. Serve on two slices of toasted bread. Choose one of the following dinners. Some people may maintain their current weight on a 1,700 calorie per day diet, some may lose weight, and others may notice a slight weight gain. While this caloric amount can result in slow, sensible weight loss, many people find they reach a plateau after a while and need to move to a 1,500 calorie per day diet to continue losing weight. The USDA's MyPlate Dietary Guidelines recommend consuming no more than 30 percent of your calories from fat each day. Therefore, a low-fat diet is one in which 25 percent or fewer of the calories come from fat. If this number sounds high, remember fats and oils play key roles in a healthy diet. Eliminating fat altogether may be just as detrimental as eating too much fat. Likewise, fat is more calorically dense than the other macronutrients. It has nine calories per gram, as compared to four calories per gram for carbohydrates and protein. This adds up quickly as a percentage of your calories eaten, so it doesn't take much fat to reach 25 percent of your calories consumed. Many natural foods contain fat, so the best way to minimize fat is by lowering the amount of added fats and oils. The following tips can help you be successful. Leafy greens are very low in fat and high in fiber, vitamins and minerals. They are a very low calorie food, so you can add them at will to your menus. Enjoy greens including romaine lettuce, spinach, kale, arugula, and Swiss chard, which will fill you up without adding a lot of calories. Non-starchy veggies like celery, cucumber, fennel, and zucchini also pack a nutritional punch without adding significantly to the caloric totals. Vinegar makes a great low-calorie dressing for greens with about three calories per tablespoon and no fat. Add a variety of vinegars to spice up your food such as red wine, Champagne, balsamic, and cider vinegar. Use herbs and spices to spice up foods without a lot of calories. 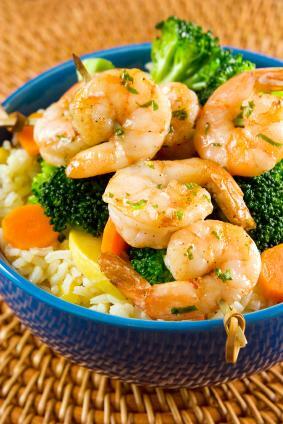 You can also use moderate amounts of soy sauce, Sriracha, harissa and mustard to add flavor without a lot of calories. If you enjoy dairy, choose non-fat dairy products to keep fat and calories low. Switch highly processed "white" foods such as white rice or white bread for their whole-grain counterparts. It adds negligible fat and calories, but increases fiber and nutrients. MyPlate recommends making fruits and vegetables the bulk of every meal. Consider having a salad and a steamed vegetable for dinner, which will increase nutrients and fiber without adding many calories. Choose lean cuts of animal protein such as fish and seafood, lean beef, lean pork, and skinless white meat poultry. For variety, many game meats like venison and elk are also quite low in fat. Low-fat and low-calorie doesn't always mean nutritious. Many boxed and canned foods are billed as low-fat or low-calorie, but also contain very little nutrition. Instead, choose nutrient-dense whole foods like fruits, vegetables, and whole grains so that you get the nutrition your body needs. Make exercise a regular component of a healthy lifestyle, particularly if you wish to lose weight on this eating plan. Talk to your doctor before starting any diet. The 1700 calorie low-fat diet is a good moderate way of slowly losing or maintain weight while keeping hunger in check. By eating the nutritionally dense, low-fat foods recommended above, you'll be on your way toward better health.